Yesterday evening, the star-studded International Friendly between Brazil and Japan was kicked off in our very own new world-class International Stadium. Shamefully, for whatever reason, our kampung-field standard pitch is one of the low point of this fever pitch event. 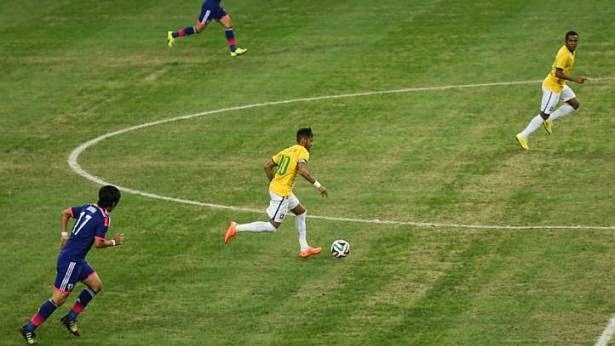 Thanks to the sterling performance from Brazil's star, Neymar, whom single handedly nailed Japan down with 4 marvelous goals and steal the show (instead of the sandy and patchy pitch). I watched the match at home but the glaring flaw of the pitch for this international sport event is still something that is hard to stomach. Having said that, set the pitch aside, overall it is still an entertaining match. In the investment/financial market scene, can you think of any business/counter that has such white knight treatment before? Tiger Airways by SIA?